KOMPONG CHHNANG DISTRICT, Kompong Chhnang province – Nine Cambodian divers are in the final phase of training, preparing to dive in pitch-black water to recover ordnance buried in river mud for as long as half a century. On Thursday, Cambodia’s first unit of demining divers received their own headquarters, stocked with $120,000 worth of underwater demining equipment donated by the U.S. government. From this building, painted bright blue, the divers are to start searching the Tonle Sap and Mekong rivers for explosives that were sunk decades ago, when the Vietnam War spilled over into Cambodia. “It will all start from here,” said Robert Rice, chief of underwater operations for Golden West Humanitarian Foundation, an American demining NGO. A former explosive ordnance disposal diver for the U.S. Navy, Mr. Rice started training Cambodia’s first underwater demining unit one year ago. Back then, many of the now-professional divers didn’t even know how to swim, said Allen Tan, general manager for Golden West. “In a testament to their personal courage, most of these volunteers began on this path without ability to swim; truly amazing when you consider the job they will be asked to do,” Mr. Tan said at the opening. Now that the equipment is stored in the new headquarters, U.S. Army experts from Hawaii are to further train the divers in July. They are to start work in the Tonle Sap river in August. “In September, we’ll have the technology and the techniques,” to salvage the first mines and unexploded ordnance, Mr. Rice said. Divers also will use a state-of-the-art, handheld sonar system to find ordnance in the pitch-black waters. Golden West estimates that in the 1960s and 1970s, the Khmer Rouge sank 300 river barges carrying U.S. supplies from Vietnam to the Lon Nol government. U.S. barges sometimes carried as much as 1,000 tons of munitions. Today, these munitions threaten public safety, regional security and hinder construction, U.S. Ambassdor William Todd said during the inauguration. “For example, construction in a new bridge had to be halted…because UXO was found in the construction area,” Mr. Todd said, referring to unexploded ordnance in Neak Leoung, Prey Veng province. 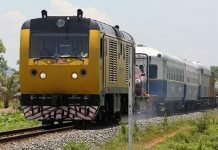 “Cambodia’s rivers are the lifeblood of the country, and the nation’s people must be able to fish, water their cattle, or just enjoy the water…without the fear of injury or death,” he added. The opening coincided with the International Day of Mine Awareness and Assistance in Mine Action. U.S. officials and representatives of the Cambodian Mine Action Center toured the new facility. Specialists from the Halo Trust, Mines Advisory Group, Golden West and Norwegian People’s Aid NGOs demonstrated demining techniques from baseline surveys to safe mine disposal and detonation. Also on display were demining dogs and specialized equipment such as Nemesis, which cuts vegetation to prepare land for mine clearance. Almost 20 years after the end of the civil war, Cambodia has cleared one-third of mined land. In the northwest, deminers mostly deal with land mines and anti-tank mines. The northeast is heavily littered with bombs and cluster munitions dropped by U.S. warplanes during the Vietnam War in an effort to cut the Ho Chi Minh Trail. In a report, “Bombs over Cambodia,” researchers Ben Kiernan and Taylor Owen found that between 1965 to 1973, a total of 2,756,941 tons of ordnance was dropped on Cambodia in more than 230,000 bombing missions. 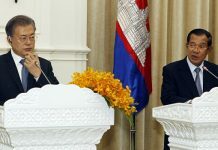 Asked Thursday whether the U.S. felt a responsibility to clear these UXO, Mr. Todd only said that the U.S. would continue to contribute to demining in Cambodia. While international donors mostly focus on countries with newer conflicts, such as Syria and Afghanistan, the U.S. has increased its contributions in Cambodia. The U.S. contributed $4.35 million in 2010, $5 million in 2011, and $5.5. million in 2012 and again in 2013, according to figures provided by the embassy. In the past 20 years, Mr. Todd said, the U.S. has contributed $61 million to demining in Cambodia. Four to 6 million mines and UXO remain here, said Chum Bunroang, secretary general of the Cambodian Mine Action Authority. 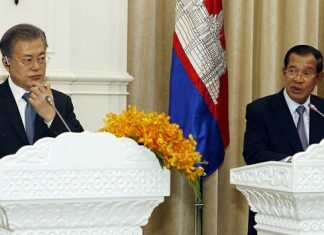 He said that Cambodia was a role model for mine action, with more than 4,500 square km cleared. Still, he said, that figure only represented one third of land off limits to mines.